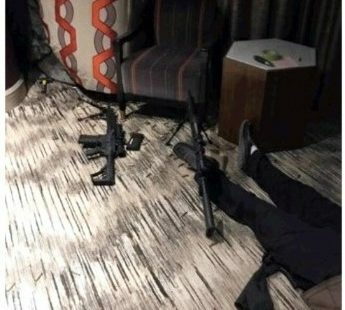 Las Vegas Metropolitan Police Department SWAT officers breached the door to room 32-135 at the Mandalay Bay Hotel in Las Vegas, and at least one officer discharged his weapon, according to the police radio recording. When the Las Vegas police was contacted today by the Baltimore Post-Examiner they stated they have no comment and that it is still an active investigation. The gunman had shot himself before the door was breached by the SWAT team, according to authorities. Why an officer discharged his weapon remains undetermined at this time. Just curious: Would it ever be SOP to put a round into a suspect who is down and appears deceased? Perhaps to confirm that the person isn’t “playing possum” and planning an ambush?